Nutella is a very popular “staple” in households. However, one man believes that his healthier alternative, which contains 97 percent less sugar and no palm oil, could convince consumers to change brands. Nutella’s sugar content has risen from 55.9% to 56.3% and its fat content is 30.9%, according to the nutritional chart. Nutella is therefore a sugar-fat cream. Did you know that? The biggest producers of chocolate are still Nestlé and Ferrero! By the way, the chocolate is still made by “modern slaves”. Nestlé has sold its US candy business to Nutella -Maker Ferrero for $ 2.8 billion. But Ferrero is under pressure since the edible oil is listed as potentially carcinogenic. In Italy, Ferrero launched a major advertising campaign after sales slumped. The advertising machinery is running at full speed because the cash register has to ring. But consumers are increasingly looking for an alternative and say: Bye, bye “Nutella”! In early January 2017, the Italian confectionery manufacturer Ferrero was fiercely criticized for using palm oil. Ferrero uses palm oil primarily for its popular spread Nutella, as the product will be creamy and easily spreadable. “If we made Nutella without palm oil, we would produce a worse substitute for the real product,” explains Ferrero purchasing manager Vincenzo Tapella on the loud criticism. Giovanni Ferrero wants, according to Forbes, only one more thing: Ferrero make even bigger. The nerve center of Ferrero is no longer in Italy, but in Luxembourg. Thanks to favorable taxes, the small state is the hub of the global enterprise. In 2017, the company sold candy worth $ 12.5 billion. The family’s private fortune amounts to an estimated $ 31 billion. Alone 21 billion US $ belong to Giovanni, which ranks 47th among the richest people in the world. Ferrero uses around 185,000 tonnes of palm oil a year! From land grabbing to murder, from the extinction of many species of animals and especially the orangutans – we have reported several times. Nevertheless, people lubricate Nutella with palm oil on the bread and bring the Ferrero Group two billion euros from the already 20 billion euros, the Ferreo made in the past fiscal year in sales. Yet a man from Melbourne believes that his healthier alternative could convince consumers to change brands. Nuttvia has a very similar name and contains 97 percent less sugar and no palm oil. Brand inventor Samuel Tew has developed a formula for the product, confident that it will be able to market it in supermarkets in the face of the growing appetite for healthier alternatives. He admits that it is a lofty ambition to take on such a popular brand as Nutella, but nonetheless, since 2000, Tew has been working to change people’s relationship with sugar, feeling he has a chance. His chocolate spread has been in the supermarkets of Coles for several months and the latest sales figures are promising. With Nuttvia, he was able to make $ 8 million in sales, even though the product has not even been on the market for more than a year. The 2017/18 sales figure is expected to exceed $ 10 million! He employs 15 people, including a marketing manager in the UK, to enter the global marketplace. Nuttvia and Natvia (an other product of him) are now available in 14 markets around the world, including New Zealand, Hong Kong, the Philippines, the United Kingdom, Iran and Singapore. Comment: I had already decided years ago for a replacement for Nutella, which is vegan. Now I’m waiting for the Nuttvia. With it we will all have a clear conscience and less kilos on the scales!! Donkey Skins Are The New Ivory In China. Immense Global Animal Suffering Results. DONKEYS are the backbone of many farming villages in developing countries. But if current trends continue, the world’s rural poor may soon need to find a new beast of burden. The animals’ ranks have thinned dramatically in many African countries: Kenya’s donkey population, for example, has fallen by half since 2009, to 900,000. The primary cause is neither disease nor declining demand for live donkeys, but instead a burgeoning market for their pelts. Since ancient times the Chinese have consumed , a gelatine made by boiling and refining donkey skin to produce a tonic taken as an elixir. As the country grew richer in the 1990s and 2000s, demand for the product grew and fewer donkeys were needed for agriculture and transport. As a result, there were only 5m donkeys in China in 2016, down from 11m in 1990. Because donkeys are relatively poor breeders, China no longer has enough of them to satisfy its thirst for . One solution is to fake the product using the skin of other animals, such as pigs. But some manufacturers have now instituted DNA testing to ensure their is genuine. The other option is to import from abroad. China’s biggest sources are African. In Kenya, the price of a donkey soared by 325% during a six-month period last year. From 2011 to 2016, the number of donkeys fell by 60% in Botswana and a fifth in Lesotho. But countries all over the world are getting in on the act. In Kyrgyzstan, which borders China, and in India, the populations fell by a fifth during 2015 and 2016 alone. Farther afield, Colombia lost almost a tenth of its donkeys and Brazil around 5% over the same period. Some South American donkeys are transported more than 1,000km for slaughter, demonstrating the reach of the Chinese demand. England: You Could Say We Are Fed Up Presenting Evidence That Is Ignored – But We Will Never Stop Exposing The Truth. Philip (CEO CIWF) and Mark (WAV) have known each other, and campaigned for better farm animal welfare, for about 30 years. As we are now covering a lot on this site about intensive pig farming and swine flu / fever; maybe it is a good time to show you one of Phil’s investigative reports when he was at one of the worlds biggest pig farms in Mexico. I hope that it will broaden your experiences and knowledge about the industry; and show that local human residents are also being greatly affected health wise by these facilities. I visited a community that was at the forefront of the swine flu pandemic. It is almost impossible to describe the absolute stench that is emitted from one of the world’s biggest pig farms in South East Mexico. On our journey, I saw at least 15 large-scale farms littered throughout the area. Despite the stench, smell pollution is the least of the problems presented here. We travelled to a town called La Gloria to investigate why some locals fell ill. They were displaying symptoms of what they believed to be swine flu. I spoke to locals who claimed their drinking water had been contaminated. To see more on how intensive pig farming effected the locals, watch my latest film. I also worked with the team at CIWF (England) when I was doing a lot re Serbian animal welfare. 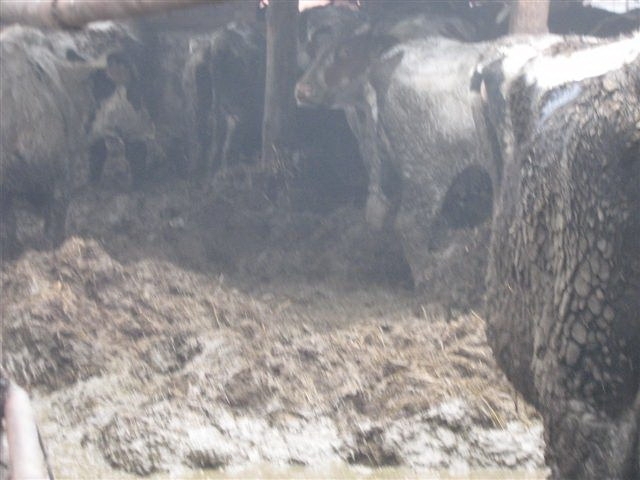 Although not pigs, the conditions on some Serbian farms we became involved with were alarming to say the least. 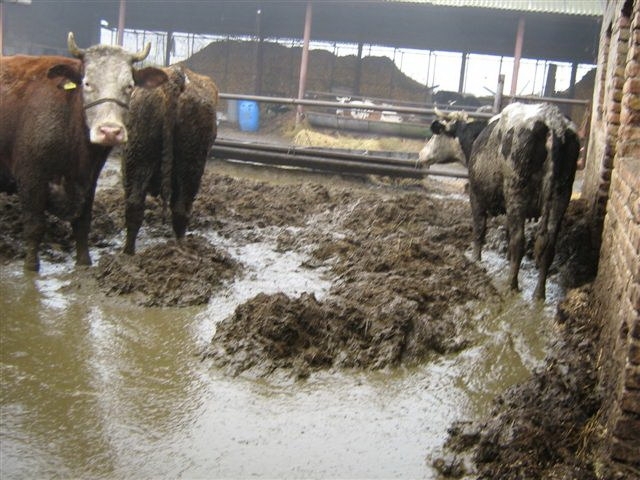 Animals kept in muck and filth way above their hooves; conditions which are certainly not compliant with EU standards for keeping animals. 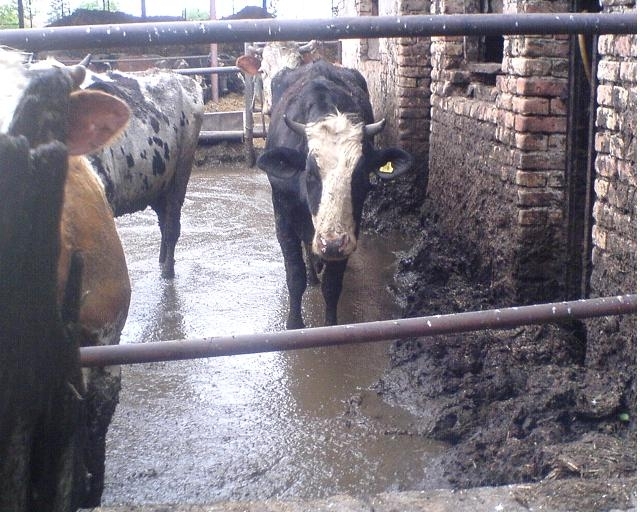 Here are a few links and some photographs relating to some of the posts I did on farm animal conditions in Serbia. I think the photographs say it all really. 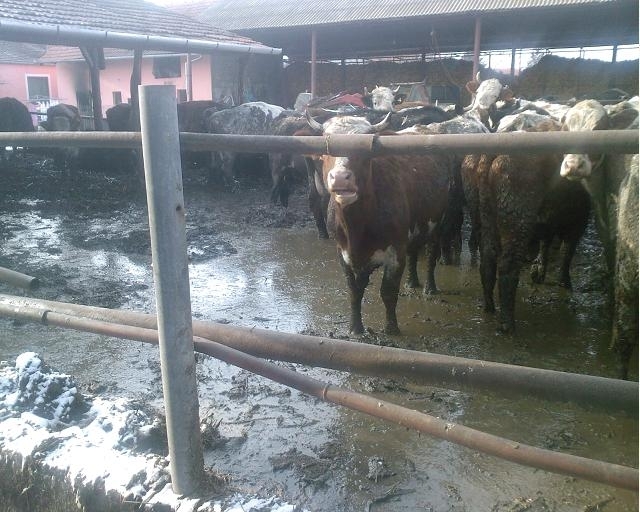 When we confronted the Serbian government Ministry about all this; they said that everything at the farm was ‘ok’ and that we should not keep hassling them ! – we don’t think it looks ok; do you ? Swine Flu – Dirty Farms – Human Health Conditions – Ignorant EU – Is there a link ? – I think so. Serbia is an EU ‘Candidate Country’; and things such as what we have exposed should be taken into full review by the EU before Serbia is allowed to join as a member state. Personally, I don’t really think the EU is interested in what we expose; just as they are not really interested in the evidence taken by Lesley (Eyes on Animals – Netherlands – https://www.eyesonanimals.com/ ) at the Turkish border re live animals being shipped from the EU. We live in hope that the EU will wake up; but accept that they like to remain the sleeping club that they are. All of our welfare groups across Europe are working together as a combined force to try and make farm animal welfare better for the animals – we will never give up until there are changes; no matter how long it takes. Above – Mark Touring In the Netherlands with CIWF about farm animal welfare. – she listened to my gripes every day !. ‘Serbian Animals Voice’ (SAV) was a site set up and dedicated to getting results for strays in Serbia. The site is still active; with all our campaign work broken down into monthly sectors. There is a massive selection of photographs from our archives. We have now moved on to form this site, WAV; to cover global animal rights issues. All posts from this site are now being posted onto SAV also. Serbia has some great activists !